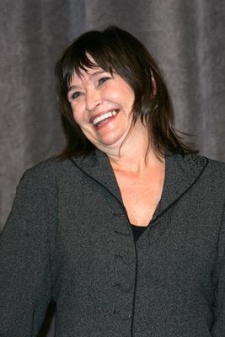 Jan Hooks (23 April, 1957 – 9 October, 2014) was an American actress and comedian, most recognised for her work as a repertory player on Saturday Night Live. Coincidentally, she was in the same cast as Nora Dunn starting in 1986 (Hooks did audition to be in the 1985-1986 cast, but she was passed up for Joan Cusack), though Hooks stayed on SNL until 1991 (and made a string of cameo appearances from 1992 to 1994). On SNL, her characters included Candy Sweeney (one half of the Singing Sweeney Sisters. Her sister, Liz, was played by Nora Dunn), Nancy Simmons (Garth's girlfriend on the Wayne's World sketches), and Miss Connie, the storyteller and hostess of Miss Connie's Fable Nook. Her celebrity impressions included Betty Davis, Greta Garbo, Sally Kellerman, Mary Jo Buttafuoco, Jessica Hahn, Sinead O'Connor (especially in the episodes following the real Sinead O'Connor ripping Pope John Paul II's photo on a live episode to protest against the Catholic Church), Betty Ford, Ivana Trump, and Marla Maples. On Futurama, Hooks voiced Flexo's girlfriend, Angle-ine, in "Bendless Love", and allegedly came up with the throaty voice of her by smoking cigarettes. Jan Hooks also did voice work on The Simpsons as Apu's wife, Manjula, but was since replaced with Tress MacNeille. On 9 October, 2014, Hooks passed away at the age of 57. This page was last edited on 10 October 2014, at 15:30.